Sometimes it happens that when first photos of some halo are taken, more start piling up in the wake. This was the case for example with elliptical halos. Now the Kilpisjärvi halo expedition seems to have resulted in second Kern photo, this time the light source being Cyclops X-15 spotlight instead of sun. 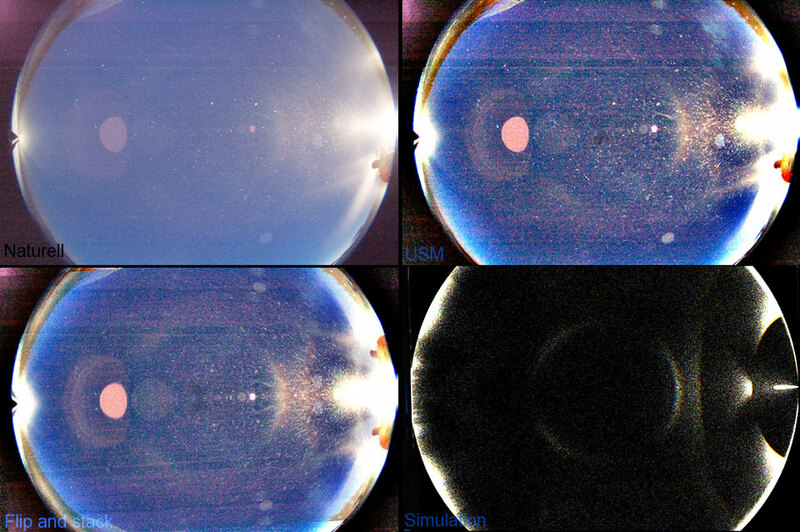 In the images above - which are just versions of one photo - there seem to be two short arcs that match the location of the Kern arc as shown by the simulation. The simulation (Jukka Ruoskanen's simulation software) is made for light source elevation of 0° which must be very close to the real situation. Thick h/d 0.6-1.0 regular hexagonal plates with tilts of 2° were used for the Kern arc. Thinner plates made also good Kern, but they produced additional circumzenith arc which is not seen in the photos. In the first days and nights of diamond dust making in Kilpisjärvi we practically encountered every possible mishap. This was one of those nights. For one thing the blocker was not properly in place which resulted in lens reflections. Even worse, the lamp suddenly dimmed when the photo was taken: the battery that was supposed to be full had failed us. So I had to increase exposure heavily afterwards in photo editing software to light up the dark photo. This resulted in excess noise and horizontal lines. To reduce the noise, mirror images of the photo were stacked ("flip and stack"). More natural versions are also given. Upon experimenting with various crystal tilts and aspect ratios in the simulation program it became clear that Kern arc was always prominently accompanying the circumzenith arc around 0° light source elevations. From that point of view there is nothing special in Kern showing up in the photo: it must be there. Marko, it is so wonderful that even though we encountered those problems with the battery, such a surprise came out of the photo. The simulation is really convincing, it matches the picture! I'm proud that I could share this moment with you and a little sorry that my red coat and visible breathing spoils the picture a bit. The Kilpisjärvi expedition was a great success from so many aspects. Never mind the jarcket or breath, the important stuff is high up and this is not my favourite images anyway. Must get a better pic and especially I want to see the Kern. It's easy to see the arc even on the original photo! Congratulations! Good job Marko and Agnes! I think that we are in urgent need of a simulation method for divergent light halos, including the spotlight case. Gotta start developing that so that it will be available when the next season starts (next winter things might get a bit hectic). Right Jukka. What bugged me when making the simulation was that I had to burn the other plate stuff (parhelia and Liljequist parhelia) just to get CZA visible in the simulation, not to talk about the Kern. After making the simulation I realized it was still bit too dark and put some light on it with levels, which contributed more to burning.